Whole Grains by Lorna Sass is the ideal cookbook for those cooks who love good food but also want to eat food that is good for them. 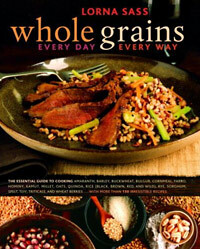 It presents all the information and accompanying recipes for dozens of the whole grains that are the healthiest. This book will allow you to seamlessly incorporate more whole grains in your diet with minimal fuss and without skimping on flavor. Sass gives us a brief intro into what whole grains are and why we should be eating them. Now we are ready to cook with grains. For almost 100 pages Sass provides us with Grain profiles for the most common and best grains to cook with. This includes how to buy them, how to cook them, cook’s notes and compatible foods and flavors. This section alone is well worth the retail price of the book. But there is more. The recipes in Whole Grain are divided into 5 section; stand-alone soups and salads; main courses; on the side; breakfast and brunch and desserts and baked goods. There is a nice balance of meat and meat-free dishes in the lot, needn’t become a vegetarian to eat healthy with grains. Wild Rice with Gingered Squash, Kamut with Saffron-scented Mushrooms and Leeks, Wheat and Oat Scones with Cranberries, Barley and Sesame Chicken Stir-fry and Spelt Gingersnaps are a few of the dishes that have sold me on cooking with whole grains and introduced a new repretoire in my kitchen. While there are not photos for every dish in the book there is an insert that includes an overhead shot of all the grains for easy reference. This is a fantastic book and one we highly recommend.